Calcium deposits, or efflorescence, form when excess moisture within cement rises to the surface. These white, powdery deposits are common on basement walls, floors and other cement surfaces. Although efflorescence is not harmful to cement, excessive amounts of it may cause mold or insect problems. Once calcium deposits harden, they are virtually impossible to remove without acidic solutions. Stronger acids are required for heavier calcium deposits. Remove heavy calcium deposits from concrete surfaces. Dress appropriately for safety purposes. Wear protective clothing, eye goggles, acid-resistant gloves and a respirator equipped with an acid-grade filter. Set a portable fan nearby and open any windows to provide adequate air circulation. Fill a clean spray bottle with acetic acid. Spray the acetic acid generously onto the calcium deposits. Allow the acid to soak into the cement for the recommended amount of time. Follow the manufacturer's directions on the product's label. Scrub the cement with a stiff bristle brush to dissolve the calcium deposits. Continue applying the acetic acid and scrubbing the cement until all calcium deposits are removed. Sprinkle baking soda liberally over the clean cement to neutralize the acid. While the acid neutralizes, fill a plastic pail with water. 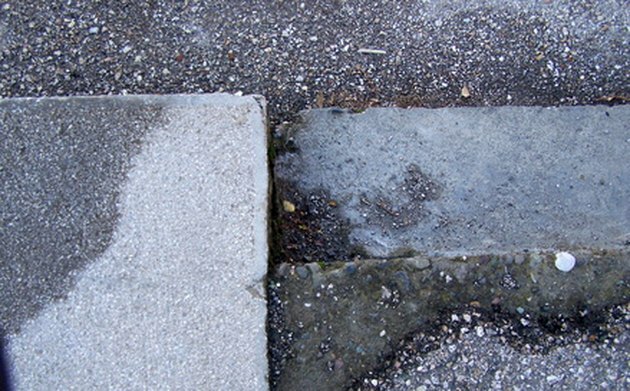 Clean affected surfaces promptly to restore the cement's appearance and prevent further problems. Do this by rinsing the cement thoroughly with the water, using a thick sponge. Allow the cement to air-dry. What Is the Difference Between Lime & Cement?